Café Oliver is a bistro restaurant offering Mediterranean cuisine. The average price of a main course dish at the Café Oliver restaurant is 18 euros. The average price of a 3-course meal at the Café Oliver restaurant is 35 euros. Note that although GoMadrid.com strives to maintain all information about Café Oliver up to date, the prices mentioned are only an indication and may not reflect the exact value of your meal. Chef Frédéric Fétiveau, who gained experience in Paris working in Jules Verne and Hotel Bristol, serves the best from the French, Italian, Spanish, and Moroccan cuisines in this Bistro-style restaurant. The menu is complemented by an impressive winelist which features more than 130 wines mostly from Spain and France. There is also a bar downstairs, Eo, which serves excellent cocktails, classic ones as well as own creations. One weekends DJ's play various styles of music, from R&B to House and Dance. 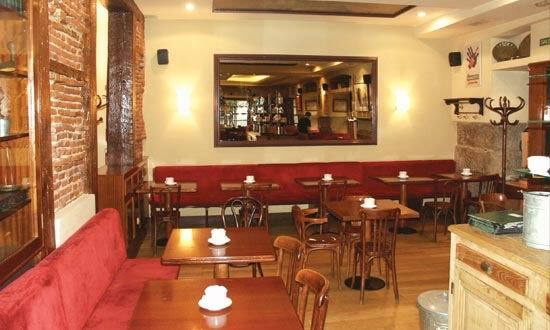 The address of the Café Oliver restaurant is: Calle Almirante, 12, 28004 Madrid. The nearest Metro station is Chueca. Please see the Café Oliver restaurant location map below.